Another tablet from Intel has surfaced online. This new tablet, Intex i-Buddy Connect II comes with 3G connectivity and has been priced at 7500. It is the successor of i-buddy Connect 3 G Tablet launched earlier this year and sport standard 7 inch Tablet specifications in this price range. 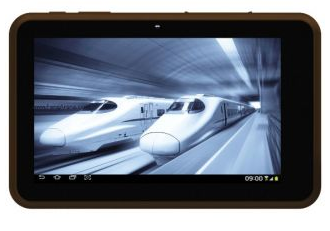 This tablet features a 7 inch display with WVGA resolution of 800 x 480 pixels. Many Tablets like Lava E-Tab XTRON+ and Lenovo Idea Tab A1000 will offer you a better 1024 x 600 pixel resolution in this price range, but this is standard display specification in this price range. This phone is powered by a 1 GHz Dual core processor which will suffice for intended purposes; however the 512 RAM backing up this processor might leave you hungry for more. Many manufacturers will provide you with 1 GB RAM in this price range. The internal storage capacity is 4 GB which can be further expanded to 32 GB using a microSD card. On the software front this phone is equipped with Android 4.0 ICS operating system. The camera specifications are again pretty standard with a 2 MP primary camera and 0.3 MP front camera for video calling. Almost every tablet will offer you similar camera specification at this price range. This tablet comes with a slot for SIM card for voice calling and 3G and comes with various other pre loaded social networking apps like Facebook, yahoo messenger, nimbuzz along with other popular apps like Fruit Ninja and Moto racing. This phone features a 3000 mAh battery which falls short of expectations. Lava E-Tab XTRON+ and Lenovo Idea Tab A1000 both provide a better battery capacity of around 3500 mAh. Other connectivity features include Wi-Fi, Bluetooth and HDMI connectivity. This is the fourth iBuddy tablet in Intex series and comes brings nothing new to the table. This tablet will suffice for general purpose usage and you can buy it from Shopclues for a price of Rs. 7,500.